Abstract: With the advent of fiber optics, electrical signals are routinely carried over long distances on optical carriers. This technology has been a major contributor to the explosive growth of the Internet and digital data communication. The use of optical fibers for transmission of analog signals at RF and microwave frequencies has been less widespread since in most applications fiber links, requiring a conversion of the electrical signals to optical and back again, degrade the quality of signals that they carry. Recent advances in high performance optical devices have overcome this limitation and optical links with less than 10 dB noise figure for signals up to 10 GHz are now a reality. The next step in the evolution of microwave photonics technology is to go beyond a simple transmission of microwave signals, and perform data processing functions for receiver front ends. In this talk I will discuss advances in devices and components that have made possible realization of RF, microwave, and millimeter wave receiver front ends with photonics technology. Utilizing linear and nonlinear physical properties of elements in photonic systems we have realized microwave and millimeter wave receiver front ends with small size, weight, and power, not achievable with conventional electronics. Furthermore, some of these devices offer improved performance beyond what is possible with current state of the art in electronics. In particular, examples of devices and schemes based on the physics of crystalline whispering gallery mode resonators will be presented, and target applications will be discussed. Biography: Prior to joining OEwaves as President & CEO, Dr. Maleki was a Senior Research Scientist at the Jet Propulsion Laboratory (JPL) where he created and grew the Quantum Sciences and Technologies Group over 23 years. In that capacity, Lute Maleki was responsible for the multi-million dollar budget of the group, and the management of one of the largest technical groups at JPL that was internationally recognized as a leader in atomic clocks, frequency standards, and an array of photonic and quantum sensors. Dr. Maleki engaged in the development of atomic clocks based on ion traps and laser cooled trapped atoms; development of sensors based on atom wave interferometers; study and development of ultra-stable photonic oscillators, the opto-electronic oscillator (OEO), and photonic signal distribution systems; study and development of whispering gallery mode microresonators and their applications in microwave photonic systems; and tests of fundamental physics with clocks. Dr. Maleki's group at JPL achieved the highest stability with an atomic standard, demonstrated the highest stability photonic link for analogue signal distribution, and applied whispering gallery mode microresonators as novel, ultra-high sensitivity filters, modulators, and sensors. He is an inventor on over 35 U.S. Patents and applications, including the OEO, and has authored and co-authored over 100 refereed publications, and over 200 conference proceedings. He serves on the technical committees of major international conferences devoted to frequency and timing, and optical sciences and engineering. 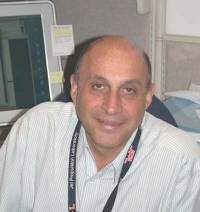 He is a Fellow of the IEEE, a Fellow of the American Physical Society, and a Fellow of the Optical Society of America. He served as the Associate Editor for Frequency Control, Atomic and Optical, and IEEE Transactions on UFFC. Lute Maleki was awarded the distinguished IEEE I.I. Rabi Award for his scientific and technical leadership in atomic frequency standards, and the NASA Exceptional Engineering Achievement Medal for the development of atomic clocks and oscillators supporting the U.S. space program. Dr. Maleki holds a B.S., M.S. and Ph.D. in Physics.